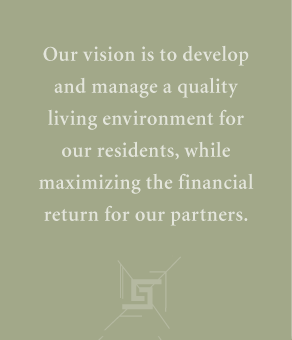 The development process demands the focused effort of everyone involved, drawing on every discipline associated with multi-family real estate. The hundreds of decisions that are made during the earliest stages of development will determine how well the property will operate and satisfy its objectives, which affect near-term and long-range revenues, operating costs, and value. Synergy’s unique development approach and management process guide everyone involved by delivering a completed project on time and within budget. Synergy’s primary role is to set the project goals and objectives and to ensure achievement of those directives. Every team member’s decisions and actions, at each stage of the process, are mindful of the developer’s expectations. All budgets, proformas and schedules are created with direct involvement; and all decisions affecting design, scope, and value engineering are presented for developer approval. Synergy’s entire development management process is replete with decision points for input and direction.